A comet made a rare pass by Mars on Sunday, passing just 87,000 miles from the planet, less than half the distance between Earth and the moon. NASA said the comet, which is believed to be a first-time visitor to the inner solar system, passed 10 times closer to Mars than any known comet has passed by Earth. 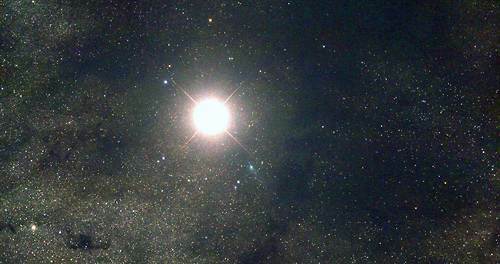 Photo: A telescope at the Tzec Muan Observatory in Australia generated images of Mars and Comet Siding Spring on Sunday as the two celestial objects moves closer together. The comet is the greenish spot near the center of the field of view. Mars is the bright spot in the picture. This entry was posted on October 20th 2014 at 10:30am/10:30 and is filed under Live News Column 2, Science. You can follow any responses to this entry through the RSS 2.0 feed.